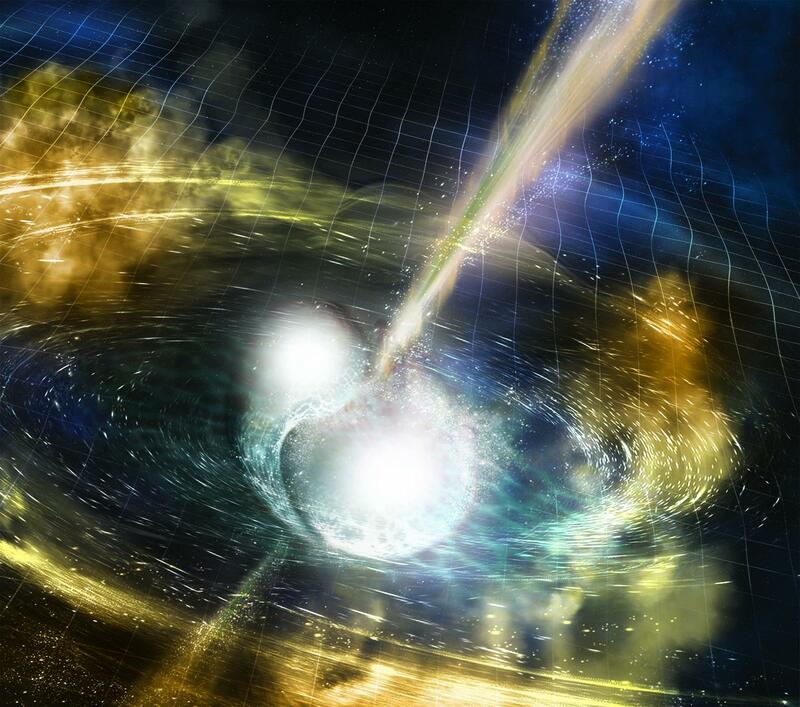 <h2>Neutron star collision gives rise to ‘multi-messenger’ astronomy</h2><br /><p>The event, which allowed scientists to confirm that gold and platinum are formed in such collisions, marks a new approach to astronomy where different forms of observation are used to create a detailed picture of what’s happening.</p> <p>In this case the collision was observed through both gravitational waves and electromagnetic waves including light.</p> <p>‘With this detection is born what is called multi-messenger astronomy,’ said Dr Michele Punturo, former detector coordinator of the VIRGO gravitational wave observatory and researcher at the National Institute for Nuclear Physics, both in Italy. ‘It is the new nature of the detectors that are pushing for that.’</p> <p>A neutron star is a small relic of a collapsed star, tens of kilometres across but with a mass equivalent of one to two suns. Because of its small size, the matter in a neutron star is extremely dense, packed so tightly that even one sugar-cube-sized chunk of it would weigh a billion tonnes, or as much as Mount Everest.</p> <p>The collision, or coalescing, of two neutron stars, which took place 130 million years ago, was first detected by VIRGO and the US-based LIGO gravitational wave observatories.</p> <p>On 17 August scientists detected a clear and unusual signal which was long lasting and indicated a mass far less than that of a black hole. They were able to triangulate the origin of the signal to a particular region of the southern sky.</p> <p>At around the same time, NASA’s space-based gamma ray observatory Fermi detected a strong gamma ray burst from the same region of the sky.</p> <p>Subsequently, an array of 70 telescopes and detectors around the world, including NASA’s Hubble telescope, pivoted towards the source of the signal to confirm the rare event. It was also verified by the Very Large Telescope at the&nbsp;European Southern Observatory,&nbsp;which has been&nbsp;partly funded by the EU to the tune of EUR 14 million.</p> <p><img class="@alignleft@" title="Gravitational wave observatories (in yellow) and 70 telescopes and detectors (in blue) worked together to detect the neutron star collision. Image credit – LIGO/VIRGO" src="https://horizon-magazine.eu/sites/default/files/GW%2BEM_Observatories_Map_0.jpg" alt="Gravitational wave observatories (in yellow) and 70 telescopes and detectors (in blue) worked together to detect the neutron star collision. Image credit – LIGO/VIRGO" width="4804" height="2701" /></p> <p><strong>Range of data</strong></p> <p>The telescopes collected a range of data as well as gravity waves and gamma rays, including visible light, X-rays, radio waves and other signals.</p> <p>The results, which are <a href="https://journals.aps.org/prl/abstract/10.1103/PhysRevLett.119.161101" target="_blank" rel="noopener noreferrer">published today</a> in the journal <em>Physical Review Letters</em>, are co-signed by 11 researchers whose PhDs have been funded through the EU’s GraWIToN project.</p> <p>Dr Punturo, who coordinates GraWIToN, a <a href="https://ec.europa.eu/research/mariecurieactions/about_en" target="_blank" rel="noopener noreferrer">Marie Skłodowska-Curie project</a>, said that gravitational wave detection has opened up new opportunities for observatories. ‘For the first time we are listening (to the universe),’ he said.</p> <p>‘I think all the scientists working with telescopes understood … the importance of the novelty introduced by gravitational waves and this paid off for everybody because now we have 70 telescopes that participated in one of the largest discoveries of the past years. '</p> <p> <div class="quote-view quotesBlock quote_horizontal"> <div class="quotesTop"><img src="https://horizon-magazine.eu/sites/all/themes/horizon/images/quotes_top.png" alt="" title="" /></div> <p>This is a wonderful achievement.&nbsp;But it’s really the beginning of something new.</p> <blockquote><p>Dr Michele Punturo, VIRGO gravitational wave observatory, Italy</p></blockquote> <div class="quotesBottom"><img src="https://horizon-magazine.eu/sites/all/themes/horizon/images/quotes_bottom.png" alt="" title="" /></div> </div> </p> <p>While astronomers believe it may take years to sift through the treasure trove of cosmic data obtained during the event, a number of key discoveries have already emerged.</p> <p><strong>Gold and platinum</strong></p> <p>For one thing, in the fiery aftermath of the collision between these two ultra-dense neutron stars, astronomers observed the signatures of gold and platinum being formed.</p> <p>Cosmological theory suggests that the only event with enough energy to create many elements heavier than iron is a neutron star collision. That theory has now been confirmed by observation.</p> <p>The event is the latest stunning success for the 21st-century’s newest form of astronomy, gravitational wave detection. The existence of gravitational waves, which have been described as ripples in space-time, was first confirmed in 2015, and the discovery led to this year’s Nobel Prize in Physics being awarded to three key contributors to the LIGO-VIRGO collaboration.</p> <p>Gravitational wave detectors feature long tunnels arranged in an L-shape with ultra-sensitive detection and measuring equipment which can pick up the almost imperceptible signs of a gravity wave.</p> <p><img class="@alignleft@" title="The VIRGO observatory in Italy has ultra-sensitive detection and measuring equipment to spot gravitational waves. Image credit – ‘VirgoDetectorAerialView’ by The Virgo collaboration is in the public domain" src="https://horizon-magazine.eu/sites/default/files/VirgoDetectorAerialView-CC_small.jpg" alt="The VIRGO observatory in Italy has ultra-sensitive detection and measuring equipment to spot gravitational waves. Image credit – ‘VirgoDetectorAerialView’ by The Virgo collaboration is in the public domain" width="4045" height="3033" /></p> <p>The existence of gravitational waves as predicted by Einstein’s theory of relativity was confirmed by observing a collision between two black holes.</p> <p>The neutron star collision, dubbed GW170817, was the first observation of a gravitational wave jointly obtained with VIRGO following recent upgrades to the observatories’ equipment. An event of this magnitude is only expected to arise once in 80 000 years.</p> <p>The next stage in the life cycle of the gravitational wave observatories is to upgrade the LIGO and VIRGO instrumentation to improve sensitivity yet again.</p> <p>Dr Punturo is looking forward to the next phase already. ‘This is a wonderful achievement,' he said. ‘But it’s really the beginning of something new.’</p> <p><a href="http://bit.ly/newsalertsignup" target="_blank" rel="noopener noreferrer"><img class="" src="https://horizon-magazine.eu/sites/default/files/news-alert-final.jpg" alt="" width="983" height="222" /></a></p> <p>The GraWIToN researchers who co-signed the research paper are Matthieu Gosselin, Daniel Töyrä, Jose M. González Castro, Imran Khan, Shubhanshu Tiwari, Gang Wang, Serena Vinciguerra, Akshat Singhal, Zeno Tornasi, Omar De Varona and Marina Trad Nery.</p> <p><em>If you liked this article, please consider sharing it on social media.</em></p> <br /> <img src=”http://www.google-analytics.com/collect?v=1&tid=UA-40077089-1&cid=neutron-star-collision-gives-rise-to-‘multi-messenger’-astronomy&t=event&ec=republish&ea=read&el=neutron-star-collision-gives-rise-to-‘multi-messenger’-astronomy&cs=republish&cm=republish&cn=republish&cm1=1" /> This post <a href="https://horizon-magazine.eu/article/neutron-star-collision-gives-rise-multi-messenger-astronomy.html">Neutron star collision gives rise to ‘multi-messenger’ astronomy</a> was originally published on <a href="https://horizon-magazine.eu/">Horizon: the EU Research &amp; Innovation magazine | European Commission</a>. In this case the collision was observed through both gravitational waves and electromagnetic waves including light. A neutron star is a small relic of a collapsed star, tens of kilometres across but with a mass equivalent of one to two suns. Because of its small size, the matter in a neutron star is extremely dense, packed so tightly that even one sugar-cube-sized chunk of it would weigh a billion tonnes, or as much as Mount Everest. The collision, or coalescing, of two neutron stars, which took place 130 million years ago, was first detected by VIRGO and the US-based LIGO gravitational wave observatories. On 17 August scientists detected a clear and unusual signal which was long lasting and indicated a mass far less than that of a black hole. They were able to triangulate the origin of the signal to a particular region of the southern sky. At around the same time, NASA’s space-based gamma ray observatory Fermi detected a strong gamma ray burst from the same region of the sky. Subsequently, an array of 70 telescopes and detectors around the world, including NASA’s Hubble telescope, pivoted towards the source of the signal to confirm the rare event. It was also verified by the Very Large Telescope at the European Southern Observatory, which has been partly funded by the EU to the tune of EUR 14 million. The telescopes collected a range of data as well as gravity waves and gamma rays, including visible light, X-rays, radio waves and other signals. The results, which are published today in the journal Physical Review Letters, are co-signed by 11 researchers whose PhDs have been funded through the EU’s GraWIToN project. Dr Punturo, who coordinates GraWIToN, a Marie Skłodowska-Curie project, said that gravitational wave detection has opened up new opportunities for observatories. ‘For the first time we are listening (to the universe),’ he said. This is a wonderful achievement. But it’s really the beginning of something new. For one thing, in the fiery aftermath of the collision between these two ultra-dense neutron stars, astronomers observed the signatures of gold and platinum being formed. Cosmological theory suggests that the only event with enough energy to create many elements heavier than iron is a neutron star collision. That theory has now been confirmed by observation. The event is the latest stunning success for the 21st-century’s newest form of astronomy, gravitational wave detection. The existence of gravitational waves, which have been described as ripples in space-time, was first confirmed in 2015, and the discovery led to this year’s Nobel Prize in Physics being awarded to three key contributors to the LIGO-VIRGO collaboration. Gravitational wave detectors feature long tunnels arranged in an L-shape with ultra-sensitive detection and measuring equipment which can pick up the almost imperceptible signs of a gravity wave. The existence of gravitational waves as predicted by Einstein’s theory of relativity was confirmed by observing a collision between two black holes. The neutron star collision, dubbed GW170817, was the first observation of a gravitational wave jointly obtained with VIRGO following recent upgrades to the observatories’ equipment. An event of this magnitude is only expected to arise once in 80 000 years. The next stage in the life cycle of the gravitational wave observatories is to upgrade the LIGO and VIRGO instrumentation to improve sensitivity yet again. The GraWIToN researchers who co-signed the research paper are Matthieu Gosselin, Daniel Töyrä, Jose M. González Castro, Imran Khan, Shubhanshu Tiwari, Gang Wang, Serena Vinciguerra, Akshat Singhal, Zeno Tornasi, Omar De Varona and Marina Trad Nery.